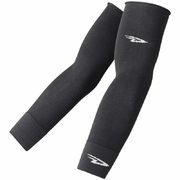 Arm warmers, ideal for early starts on cool spring and fall mornings. Two sizes: S/M for under 5ft. 9in. and 160lb., and L/XL for everybody else. Unique circular knit construction eliminates irritating seams. Designed to fit under your jersey sleeves. Specially designed cuffs stay put.